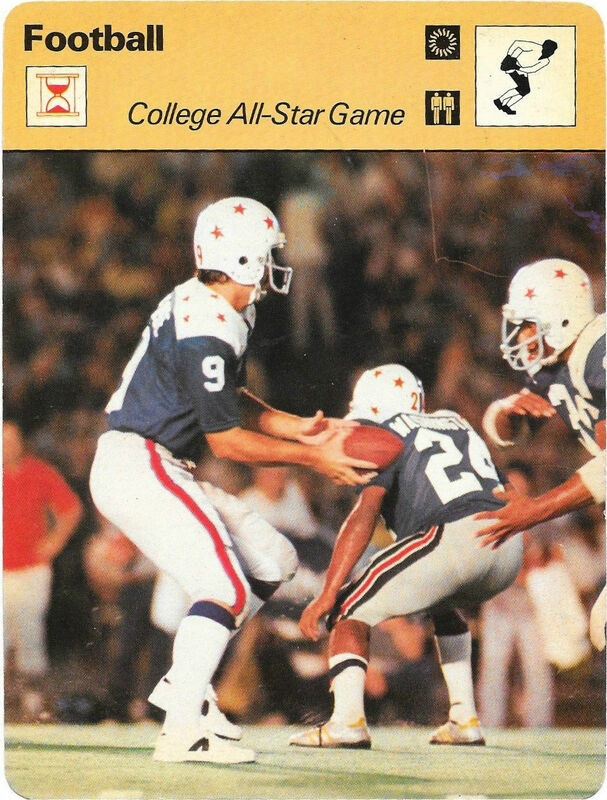 The COLLEGE ALL-STAR GAME (1934-1976) was a rather high profile event on the American sporting calendar for the better part of four decades, a spirited exhibition contest that pitted the very best of the country’s recently graduated senior class and the defending National Football League champions. This once extremely popular engagement, sponsored by Chicago Tribune Charities and staged annually with one exception over a period of forty-three years, always attracted much larger audiences than the annual National Football League Championship Game until the early 1960s and was even able to outdraw the inaugural Super Bowl, as well. The College All-Star Game reached its zenith just after the end of the Second World War when throngs of 105,840 and 101,220 spectators showed up at Chicago’s Soldier Field in 1947 and 1948, respectively. Not surprisingly, the more experienced professionals absolutely dominated the series against collegians over the years, winning 31 of the 42 games played while tasting defeat just nine times but this obvious David versus Goliath match-up probably helped contribute to the College All-Star Game’s unmistakable appeal to the American sporting public for such a long period. The annual College All-Star Game at Soldier Field in Chicago is credited by historians with having directly contributed to the growth of professional football’s popularity in a major way. From the outset, the intriguing contest generated much needed attention for a youthful NFL which was still struggling to have any meaningful impact on the American sports landscape in the 1930s; in the years following the conclusion of the Second World War, the annual Windy City clash against the collegians gave the NFL invaluable television coverage, something which did much to sell the professional brand of football to a massive audience on a nationwide basis. Therefore, it is ironic that the ever-increasing reluctance of NFL head coaches to do without their high draft picks during training camp for any length of time and the rising cost of insurance (to cover the rapidly escalating salaries of the All-Stars’ rookie professional players – a clear reflection of the NFL’s substantial increase of wealth and status) ultimately combined to bring about an abrupt and unceremonious end to the annual affair when Chicago Tribune Charities announced the dissolution of the series in late December of 1976.